It was a fool’s errand. On the day Donald Trump was elected his supporters asked him to pardon the founder and frontman of WikiLeaks, Julian Assange. They flooded social media demanding Assange be allowed to leave the Ecuadorian embassy in London without arrest and extradition to the United States. Stone silence from Trump and his administration. A few months before the election, WikiLeaks released a searchable archive of over 30,000 emails and attachments taken from Hillary Clinton’s not-so private email server. Trump held no aversion to exploiting the emails. He called them the Crooked Hillary emails and said they endangered the national security of the United States. Democrats called foul, said Assange had colluded with Putin and the Russians. In April, they filed a lawsuit in federal court against the Russian government, the Trump campaign, and WikiLeaks. They argue there was a widespread conspiracy to swing the 2016 election. Julian Assange and WikiLeaks are no longer of use to Donald Trump. He dished out pardons to ex-Arizona sheriff Joe Arpaio and neocon leaker Scooter Libby. Trump mulled other pardons, including a posthumous one for Muhammad Ali to wipe out his draft dodging conviction. It was reported in June Trump insiders are pushing to pardon the junk bond king Michael Milken and reverse his conviction on securities fraud. The Milken pardon is being pushed by Goldman Sachs alumnus and current Treasury secretary Steven Mnuchin and Trump’s son-in-law, Jared Kushner. Meanwhile, Julian Assange is left to twist in the wind. Both Trump’s attorney general and his former CIA director, now secretary of state Mike Pompeo want Assange extradited to the United States where he will face trial and possible execution for espionage. AG Jeff Sessions said the arrest and prosecution of Assange is a priority for the United States government, while Pompeo denounced him as a “hostile intelligence service,” never mind he had no problem using the Clinton emails to accuse the DNC of sabotaging the Bernie Sanders campaign. The US has leaned heavy on Ecuador. Following a meeting with General Joseph DiSalvo of the Southern Command – ostensibly to discuss “security cooperation”—Ecuadorian president Lenín Moreno rolled back security at the embassy and denied Assange access to family, friends, and doctors. They also shut down his internet connection. Moreno said Assange interfered in Ecuador’s relationship with other countries by tweeting on political events. He also lamented the “nuisance” of Assange’s political asylum and said the Australian whistleblower is an “inherited problem” left over from the previous administration. 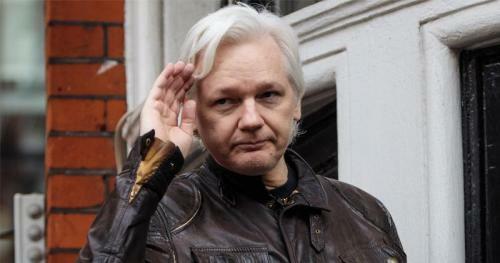 Moreno’s government granted Assange citizenship in a hope diplomatic immunity would be granted and he would leave the embassy. Assange knows better than to fall for this. Immunity or no, he will be arrested the minute he walks out of the embassy. Activist and filmmaker John Pilger took the Left to task for abandoning Assange. “There is a silence among many who call themselves left,” he said in a statement. For the establishment, it’s imperative Assange be arrested, extradited, and brought up on espionage charges in the United States. The message will be priceless, the chilling effect invaluable. The dirty secrets of war, political subterfuge, election fixing, and assorted other crimes and misdeeds are not for public consumption. The release of the Collateral Damage video and the war logs of Afghanistan and Iraq should have resulted in a larger and more active antiwar movement. This didn’t happen. Liberal and leftist opposition to war only occurs when a Republican sits in the Oval Office. Obama effectively destroyed what remained of the Bush era antiwar movement. Eights year of Obama worked like a lobotomy on the Left. Democrats supported Hillary Clinton’s war on the people of Libya. They didn’t have a problem when she arranged weapons collected from the battlefields of Libya to be sent by the CIA to the “rebels” in Syria. Democrats call for overthrowing Bashar al-Assad in Syria. They believe Russia got Trump elected and Vladimir Putin spreads lies and false news to undermine and destroy our democracy. Large NGOs, foundations, and think tanks are pushing this nonsense. Due mostly to indoctrination as a result of public education and a herd mentality inculcated by leaders and media, it is a relatively easy task for the financial oligarchy and its corporate partners to brainwash the public. It now disguises war and conquest as humanitarianism. I’m old enough to remember when millions of Americans praised Daniel Ellsberg for releasing the Pentagon Papers. That was then, this is now. Now liberals and progressives want to string up whistleblowers, same as their conservative Republican and neocon counterparts. Gore Vidal said America suffers from amnesia. Americans are largely blind to the war and financial crimes perpetuated in their name. Part of this is the result of indoctrination through propaganda media, but to a large degree Americans are incurious and unbothered by the criminality of their leaders and institutions. Most don’t care Julian Assange is a dead man walking. They are unable to see the criminal state for what it is – a global Mafia operation that shakes down entire continents and wages wars of conquest and pillage for profit.